A few years back, veteran television journalist Ann Curry '78 agreed to bungee jump off a bridge in Middlebrough, England, to raise money for two charitable organizations, Save the Children and United Way. After making sure her harnesses were properly adjusted, her jump assistant gave her simple advice: tiptoes on the edge, focus on the horizon. Then, Curry executed a perfect swan dive toward the river, 120 feet below. That's how Curry, 56, has approached her 25-year journalism career, with fearlessness and professional abandon, whether covering war zones in Syria and Rwanda, traveling to Japan in the aftermath of the 2011 tsunami, or climbing Mount Kilimanjaro to report on global climate change. 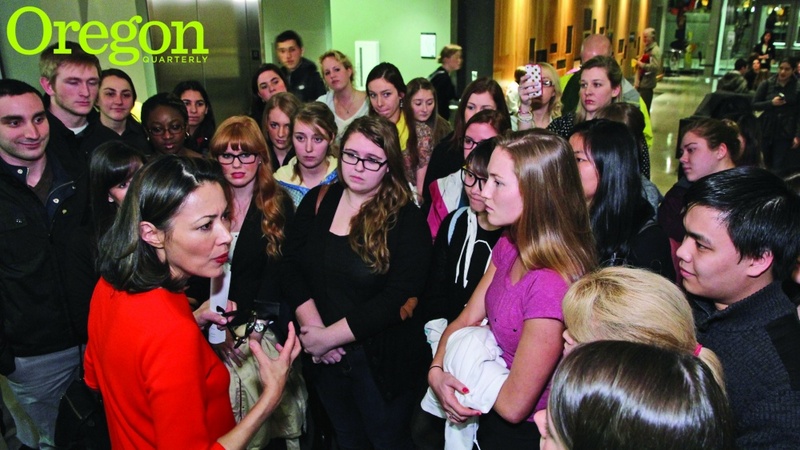 Curry drew on her rich vein of experience in late February when she exhorted a packed audience of 250 mostly journalism students to hold on to their sense of mission and not be distracted by ratings, page views, or other measures of fleeting media popularity. "Stand up for stories that people should know about, even if the subject matter might not be popular," Curry told the rapt crowd at the Ford Alumni Center's Giustina Ballroom. "This has always been the ethic that has set apart the great journalists of our time. Let it be what sets you apart." Curry, who grew up in southern Oregon, was on campus to deliver the School of Journalism and Communication's Ruhl Lecture. The annual event, which fosters contact between the journalism school and members of the media, is endowed by Mabel Ruhl, widow of Robert Ruhl, former editor and publisher of the Medford Mail Tribune and a 1934 Pulitzer Prize winner. Curry referred to journalism's past and stressed that students in the audience would be instrumental in creating its future. "You are joining an ancient tribe, a continuum of truth-seekers, each taking the baton and running, often headlong into a headwind, one generation after another, reshaping our profession, from Stone Age storytellers to town criers to city editors to newspaper boys to radio reporters to newsreels, then to television broadcasts and live reports," she said, an evolution that has led to today's "immense, unpredictable, and intoxicating Web." "Is it possible your generation will make the fathomless Web into a limitless home for quality reporting? I actually think you can, and I dearly hope that you do." Curry stressed that this new generation of journalists will be forging a different kind of relationship with news consumers. "It is your time to become agile and to become open to what will be a new world of constant change and a deepening relationship between journalists and citizens," she said. Despite the challenges that invariably come with reporting news, and the reports of journalism's uncertain future, Curry assured students their commitment to the profession is not crazy. In fact, she said, "It's courageous and it's smart." "It puts you in line to grasp one of life's rarest and most exciting of opportunities, the chance to pioneer something entirely new," she said. "And it dangles that richly fulfilling prospect of having a life telling stories that might help make the world a better place." Commitment to such stories will likely lead to some bumps along the way. "The question is, will you stand back up?" she said. "And what will you stand up for? "I have faith that if your motives are pure, that eventually good will come. It is in this way journalism is an act of faith in the future. It's not about what you get, it's about what you give." Curry, who has won a slew of awards for her reporting, demonstrated that resilience this past year when she was forced to step down from her one-year stint as coanchor of NBC's Todayshow, reportedly a casualty of flagging ratings. Her new title is national and international correspondent and Today anchor-at-large. The show's ratings have continued to decline since her departure. Prior to Curry taking the podium, students sent her tweets. Two large screens in the front of the ballroom projected the messages from audience members who were either physically in the ballroom, at one of the two campus overflow rooms, or watching the streamed talk online. Tweets ranged from the expectant ("So excited to hear one of my journalism idols"; "So stoked for AC") to the humorous ("@Ann Curry, look for the redhead with the pink lipstick"; and "Man if you didn't snag tickets for #Ruhl you're missing out. There's pizza, ice cream and somebody just handed me a margarita"). Curry, herself an early Twitter-user, initiated a national groundswell of goodwill last December when she tweeted a suggestion following the shootings at Sandy Hook Elementary School in Newtown, Connecticut. "Imagine if all of us committed to 20 mitzvahs/acts of kindness for each child killed in Newtown," she tweeted. "I'm in. If you are." Tens of thousands of people responded to what became #26Acts, (the name comes from the number of students and teachers killed in the shooting). The kind acts included individuals paying strangers' layaway bills, to giving away gift cards, shoveling snow, and donating to food banks. People described their good deeds via tweets and Facebook posts. In a posttalk discussion with SOJC dean Tim Gleason, Curry stressed that she didn't claim ownership of #26Acts or consider it her role to ascertain the accuracy of what people said they had done. She was more a curator, she said, who collected or retweeted people's stories so others could assess them. "The only way for it to be successful was for it to be free. And I'm pretty convinced a lot of people should feel really great about having done some really nice things as a result of the pain they felt over what had happened in Newtown." Later on, audience members waited patiently for a turn to pose with her for photos or exchange a few words. Eiko Treder was one of the first to speak with her. Treder, who works at Lane Community College, had earlier written Curry a note telling her that, after the tsunami in Japan, some of Treder's family members were missing. Curry's on-scene reports were the only ones she could listen to. "So many journalists were trying to make you cry. I didn't need that," Treder said. "She wasn't selling the story—she was telling the story. I could tell she was compassionate about the suffering and what people were feeling. When she came on, only then I felt I could really cry, share the fear and the hurt." SOJC junior Kayla Ackerman waited 30 minutes for her turn with Curry. Ackerman, too, grew up in southern Oregon, and she wanted to tell Curry she had been an inspiration to her throughout her childhood. "She is doing things that matter and making a name for herself," Ackerman said. When she finally spoke with Curry, Ackerman explained their connection and thanked her for her talk. Curry responded by turning the focus onto Ackerman. "If something I said inspired you, know that it exists already in you. All I did was touch the nerve," she said. "Let it move you into a life that in the end you'll be glad you chose."